Allahabad State University Time Table 2019 – Allahabad State University (ASU) releases the exam timetable online at the official website, www.alldstateuniversity.org. Students can check the ASU Date Sheet on this page. The University releases the semester exam date sheet in pdf. Allahabad State University Time Table can be checked to know the exam date, time, day, Subject name and code. It is advised that it is students responsibility to check them for any updates or changes made regarding the Allahabad State University Date Sheet. The University allows the eligible students to appear for the semester exam. Check the page for Allahabad State University Time Table 2019. Latest: Allahabad State University has released the exam notice regarding Regular/Private/Ex-Student Practical Exam Centre and Exam Date Details 2018-19. A student shall be considered eligible to appear for university semester exam only if S/he put the minimum required attendance in aggregate. All the eligible students have to submit the exam form and fees in the prescribed form. The examination form and fees should be submitted on or before the last date as mentioned by the university. Allahabad State University releases the Admit Card for all the eligible students. It is important to carry the admit card on the day of the exam. Students will be able to check the ASU Time Table on this page after its official release. Time Table: Students can check ASU Time Table at the official website. How to Download Allahabad State University Time Table 2019? ASU releases the examination schedules online at the official website. Students can check Allahabad State University Date Sheet in a few simple steps. Follow the instruction to download the ASU Time Table. 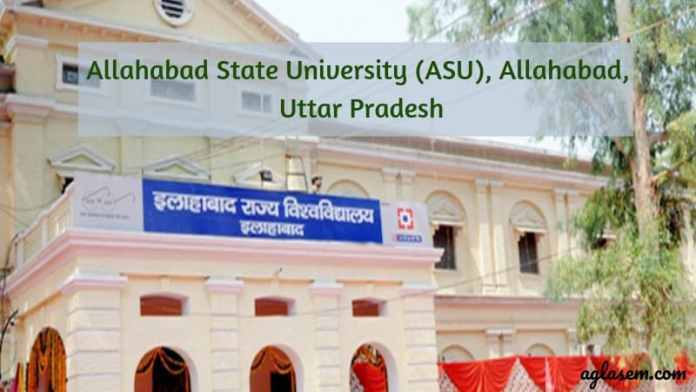 Steps 1: Visit the official website of Allahabad State University, www.alldstateuniversity.org. Steps 2: Check the Examination Notice Section available on Home Page of the University. Steps 3. In there check for Examination Scheme link and click on it. Steps 5. Check the exam date and time for your subject and download. Check the list of printed details on the ASU Time Table. Below are a few important instructions to follow by the students on the day of the exam. Carry the admit card and identity card on each day of the exam. Mobile phones and any other electronic gadget are not allowed inside the exam hall. Involvement in any kind of malpractice in the exam room will be treated under the unfair means act. Allahabad State University releases the admit card for the eligible students only. ASU Admit Card can be downloaded online at the official website of the university. A student will be able to access his/her admit card after providing the information such as Registration No and Date of Birth (DOB). If the student faces any technical issues while downloading the admit card then immediately inform the controller of exam of the university. Allahabad State University Admit Card is the most important document to carry on the day of the exam. No students will be entertained without the admit card. Students are advised to carry the admit card and follow the instructions mentioned on the admit card on the day of the exam.